Did your parents let you go out to play in the rain? Mine did. My sister and I went out and rode our bikes. My bike had a banana seat and long upright handle bars. I loved that bike. It was great for giving someone a ride and the seat was tre comfortable. We got drenched from the rain and from the puddles. It was so much fun splashing in the murky water that flooded the road by the curb. I let my daughters play out in the rain. As long as there wasn't thunder and lightning of course. It’s gotta be a childhood ritual. Did you ever play in the rain? 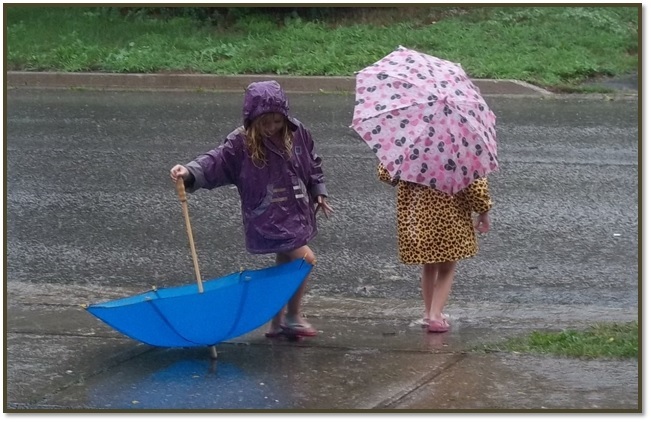 My husband thinks I’m crazy for sending my granddaughters out to play in the rain. That’s just because his parents didn't show him how much fun it can be. To be honest, I still like being in the rain. Not splashing in the puddles because it’s kind a gross. I know what kind of creepies might be in there – like worms. Ewww. But standing outside in the warm rain watching my granddaughters singing and splashing is a definite treat I would not miss for anything.